Stepping Out is a short, ‘up-front’ kind of piece, commissioned specially for the Royal Northern College of Music String Orchestra’s premiere London concert at the Barbican Centre in November 1996. The piece is based on a short repetitive pattern, heard at the outset, which dominates the music. A second idea, featuring solo strings, is more chromatic and contrapuntal although the basic rhythmic pattern still underpins it. The music gradually loses energy and stops. It starts again, this time a tri-tone away from the opening pitch of A, but then explodes into a wild fugue before the opening returns with a surprise addition to the ensemble. 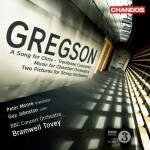 The style is intentionally eclectic (Adams meets Shostakovich with Gregson thrown in! ), but hopefully fits the brief to write a snappy concert opener for string orchestra. 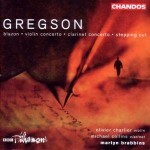 Gregson is no minimalist and the brief polyphonic second section shows how his compositional skills were honed and refined under Bush [his teacher], while he adds a spontaneous lyrical momentum all his own. … overlays lyrical and ostinato elements. During its three-minute span there is a growing sense of optimism, and a percussive surprise. … is a short, dashing work of great energy which the composer rather jocularly describes as ‘John Adams meets Shostakovich, with a bit of Gregson thrown in’.